Jon Battle-Born is a Nord citizen living in Whiterun. He is a member of Clan Battle-Born, rivals of Clan Gray-Mane. He can usually be found outside Belethor's General Goods in the Plains District, and at The Bannered Mare at night. Jon is clad in a set of iron armor, including matching pairs of gauntlets and boots. He is equipped with an iron sword, and carries a key to his family's house, as well as a selection of common items and gold. He also has a letter from Olfina. An aspiring bard, Jon desires to enter the Bards College, but his parents are hesitant to let him go. He takes pride in bardic traditions and as such, he thinks poorly of his fellow bard Mikael, who is more concerned with gold and wooing women than singing well. Jon is also generally more easygoing than most Nords in Skyrim, and values drink and revelry above all else. He can frequently be heard complaining that everyone in Skyrim is "obsessed with death." Jon is more laid-back about his family's feud with the Gray-Manes than the other members of his family, and disapproves of both the feud and the ongoing civil war. It turns out that he is secretly in a relationship with Olfina Gray-Mane, and wishes to escape from the chaotic feud with her. He carries a letter from her containing evidence of this relationship, which can be used to blackmail him into revealing the location of a political prisoner. When you approach him, he will say things like "Well met, kinsman." if you are a fellow Nord, or "Well met, traveler." if you are not a Nord. He can also be heard complaining about the current state of Skyrim: "You know what's wrong with Skyrim these days? Everyone is obsessed with death." and "People have forgotten humor, poetry and romance. I love a good sword fight as much as the next man, but there's more to life." He'll tell you about what he aspires to do: "It's my desire to enter the Bards College. My parents are hesitant, but I pray they let me attend." and "All I want it is to escape from this madness. And if Olfina can come with me, all the better. But I've probably said too much." Upon ending conversation, he can be found saying either "May your sword be sharp, and your tongue sharper." or "Keep a song in your heart, and a blade in your boot." "Ah, so it's gold you're after, then? You need only ask about. Plenty o' folk in Whiterun with too much fat and gold to be bothered doing anything for themselves." "I'm here to help, in any way I can." "Truly? Ha! By Shor, this city could use more like you. Best head up to Dragonsreach, then, and see the Jarl. He's lord of Whiterun, and can set you on the path." "A pity. And words I hear too often. But there's no shame in it. One of them dragons comes callin' in Whiterun, the place'll go up like tinder." If you ask him if he lives here, he'll answer, "Aye, that I do. Have all my life. We Battle-Borns have been here since the beginning. Along with the Gray-Manes. Our families been close as kin for generations. But Ulfric Stormcloak's uprising has divided us. Now seems we can scarce look at each other without comin' to blows. Petty and foolish, that. They're sayin' dragons have returned to Skyrim. Now that there, that's a real problem." He'll point you out to a place you can find work, should you ask him. "Ain't sure if they're takin' on new members, but you should talk to the Companions. They're over in their hall, Jorrvaskr. If by 'work' you mean 'testing your steel in bloody battle.'" You can also ask him where you can get a drink, to which he'll reply, "Ha! The most important question of all, that one." He'll continue with either "You'll want the Bannered Mare. See old Hulda, she'll keep you swimmin' in mead. But mind he [sic] bard, Mikael. Poncy little milk drinker, that one." if both Hulda and Mikael are alive, "You'll want the Bannered Mare. See old Hulda, she'll keep you swimmin' in mead." if Mikael is dead but Hulda is alive, or simply "You'll want the Bannered Mare. See Olfina, she'll keep you swimmin' in mead." if Olfina is alive. If he mentions Mikael, you can ask him why he doesn't like Mikael, which he'll explain, "Man gives bards a bad name. We Nords have a long history as warrior poets. I am proud to count myself among them. But Mikael... He sings only for gold and the affections of wenches. He dishonors our traditions." During this quest, if you try to talk to Jon about Thorald, he will initially be dismissive of your question, saying, "Oh come on, leave it alone. He's gone. There's no use in talking about it anymore. I wish everyone could just get past that and get on with their lives." However, you may wish to go further and interrogate him to reveal the location of Thorald Gray-Mane. Pickpocket Olfina's letter to him and show him the letter. He will be shocked: "You what? Oh no. No, no, no. This can't be happening. Please, you can't tell anyone. It must remain a secret! I'll do whatever you want." You can continue by telling him that you want to know about Thorald, though Jon will be dismissive at first, saying, "What makes you think I know anything? Everyone knows he's dead and gone!" You can reply by saying, "Shall we see what your father thinks of this letter?" and he'll cave in: "Okay, okay! All I know is that Idolaf made some effort to find out what happened to him, but was told to stop asking questions. He got some letter from the Legion and has left it alone since then. I'll prove it to you, all right? I'll get you the letter. Just... meet me at the statue of Talos, and don't tell anyone about this." 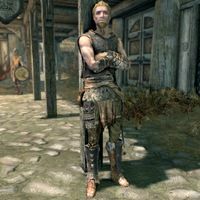 Later you can approach Jon at the statue of Talos in the Wind District. He'll give you the Imperial missive, saying, "Here's the letter. Now leave me out of this." A letter from him exists in game data, but cannot be obtained in normal gameplay. You could have used this letter to blackmail Jon. This page was last modified on 2 June 2015, at 10:57.